Our homemade dulce de leche (duel-say ● day ● lay-chay) is an all-natural, preservative free, milk spread conceived in Argentina, but made in the USA. We start with top quality raw materials, including fresh-from-the-farm milk provided by local creameries that promise to only produce antibiotic-free milk. Our dulce de leche is hand made in small batches in copper kettles. We never compromise quality. The finished product has an exclusive flavor that is irresistibly smooth and creamy—it’s simply dulce delicious! 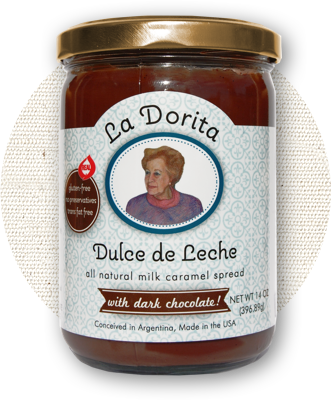 La Dorita’s strength lies in its authenticity—it is an Argentine product produced locally with Pennsylvania and US grown products by, Josephine, an Argentine-American who soaked in her Grandmother Dorita’s love for the kitchen as a child. 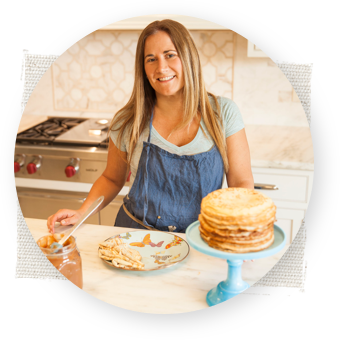 Josephine and her husband, Gastón, have been creating their homemade dulce de leche, using a recipe passed down to her from Grandma Dorita, for several years now. Grandma Dorita turned 90 on September 25, 2009. In honor of her birthday, Josephine decided to bottle her up, along with the delicious experiences she has shared with her, and share her Argentine Grandma with families, friends and gourmet connoisseurs who still long to make every meal special. 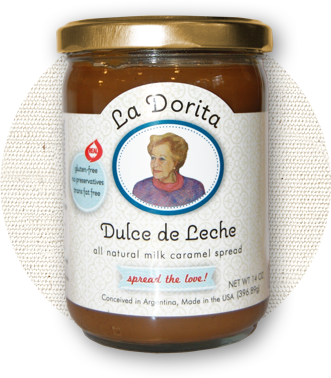 La Dorita dulce de leche offers a simple, daily food alternative made from the freshest local ingredients available that Grandmother Dorita raised her 13 grandchildren on. At La Dorita will never compromise quality, which is why our dulce de leche does not contain chemical additives, preservatives, glucose syrup, high fructose corn syrup (HFCS), thickeners, flavorings, etc, in its making, unlike the majority of the foreign competitors. We promise you one thing: Our dulce de leche will make you appear to be a gourmet foodie—regardless of your level of skill in the kitchen. La Dorita dulce de leche lends itself to endless recipes, at the breakfast table, lunch table, dinner table, dessert table—even at the hors d’oeuvre and cocktail tables! Our dulce de leche constantly challenges us to come up with creative ways to use it. We love hearing from our customers about new recipes and ways to use dulce de leche that they have come up with! You can feel good about craving a dollop of La Dorita dulce de leche; it’s not only a healthy choice for you, it’s a show of support for Pennsylvania’s dairy farming families. La Dorita Dulce de Leche: Yes, it’s tricky to pronounce (It seems so simple in Argentina!) Don’t be shy, it sounds like this: duel-say ● day ● lay-chay. Or you can just say La Dorita DDL for short! Our all natural milk caramel spread is 100% preservative-free and has only three major ingredients: raw milk, sugar and vanilla bean. Our handmade dulce de leche lends itself to endless recipes starting at the breakfast table and taking you through the rest of the day. Spread on toast, croissants…spoon over pancakes, waffles…for sweet bitefuls, tuck into crêpes, cakes, cookies…drizzle warm over your favorite ice cream…mix into mashed banana, yogurt, or hot oatmeal for a healthy baby treat…or simply grab an apple and dip away! We didn’t think our Dulce de Leche could get any better, but then dulce met chocolate, and not just any chocolate: 100% all natural dark cocoa. It’s been magic ever since. Our all natural dark chocolate milk caramel spread is 100% preservative-free and has only four major ingredients: raw milk, sugar, 100% cocoa, and vanilla bean. For all of you chocolate lovers, our spread provides a healthy alternative to meet your chocolate fix for the day, and is a wonderful alternative to Nutella for anyone with nut allergies. Our handmade dark chocolate dulce de leche lends itself to endless recipes starting at the breakfast table and taking you through the rest of the day. Spread on toast, croissants…spoon over pancakes, waffles…for sweet bitefuls, tuck into crêpes, cakes, cookies…drizzle warm over your favorite ice cream…mix into mashed banana, yogurt, or hot oatmeal for a healthy baby treat…or simply grab an apple and dip away!